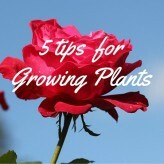 Home » Posts Tagged "growing plants"
5 tips for growing plants – Don’t let the Cold Winter Stop You! Growing flowers may be easier than raising kids, but the two pursuits have their similarities. Building a good home environment for strong roots, weeding out bad company, giving extra protection at the toddler stage, providing support but more independence as they mature, and making the important link between proper nutrition and strong growth will lead to the pride and satisfaction of guiding your young upstarts to blooming maturity.